When Robert Spargo built his cottage in 1855-1856 at 5 St Judes Street in Willunga, he diverted the outflow from a nearby spring onto his land so as to have water available for making the ‘cob’ walls. The spring water was also used to water the large vegetable and fruit garden (and duck pond) on which the family relied to supplement their income, especially after Robert’s death. In wet winters, flooding was a problem. In dry summers, however, there was not enough spring water for the garden. 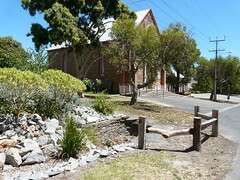 In its early years Willunga Council was constantly trying to act in the community’s best interests by creating drains to divert water to and from neighbouring properties, and mediating disputes between neighbours about water flow and watercourses. In May 1875 Grace Spargo, through her solicitors, claimed 100 pounds from the Willunga Council for damages sustained by her as a result of Council having ‘deprived her of the spring water that passed over her land at Willunga by having changed the course of the flood-water from running by Mr Martin’s land to Mr George Sara’s and running it to flow in from off his land’. The Council was probably sympathetic to Grace Spargo’s claim and attempted to appoint Reverend E Miller as a mediator. But this was rejected by Grace and the case proceeded. The Chief Justice summed up in favour of the Council, but to the astonishment of all present, the jury found in Grace Spargo’s favour because, as one of them explained, ‘it would have been very hard to throw the costs of the action on the poor old woman’! The Council appealed, but the case was declared a ‘non-suit’. The Council sold some blocks of land to pay their costs. Grace Spargo had to sell her cottage to pay her solicitor’s fees. The solicitors appear to have bought the cottage and then embarked on further proceedings against Willunga Council on Grace Spargo’s behalf, presumably to give her the chance to buy her property back, this time for damages of 500 pounds! The records become confusing at this stage. However, Grace never regained the ownership of her cottage, although she lived in it and paid the Council rates until she moved to Adelaide in 1883. This is said to have been one of the first Riparian Rights Court cases in South Australia. Drainage problems continue to this day in St Judes Street and other streets. Even today there is evidence in St Jude’s Street of the drains, channels and culverts that caused such bitterness over 120 years ago. Not accessible or visible from the road, are the remains of the duck pond in Spargo’s garden. The garden and pond were pipe-fed from a spring across the road (which still runs). Although the pipe under the road was cut when deep drainage was introduced, the pond still fills with storm-water from the remnants of this pipe in the creek along the front of the property. The culvert at the side of Spargo’s cottage was restored in the 1980’s by the District Council of Willunga which recognised its historic importance as one of the few remaining slate box gutters left in the area. However, by 2001 the condition of the slate in the culvert had deteriorated and it was replaced by a large pipe. At the front of the cottage are several slate pieces embedded in the creek which have been uncovered by the flow of the water. It seems that they may have been placed there some time ago in an attempt to slow down the flow of the water in front of the cottage. After a heavy rain, the water runs past the cottage from four different directions (Bishop’s Street, both sides of St Jude’s St and St Mary’s Street). Drainage, St Judes Street, 2013. Do you remember Riparian rights ? Then Join up and add your memory here.